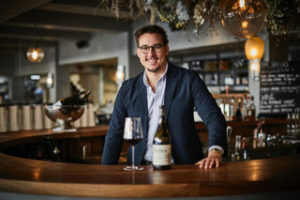 Pasta and grappa concept Morso is aiming to build a 20-plus estate, targeting outlying communities of London, Propel has learned. Morso has just gone public on its £250,000 fund-raise on crowdfunding platform Crowdcube to support its next stage of growth to open two sites in 2019. It is offering 11.90% equity in exchange for the investment, giving the company a pre-money valuation of £1.89m. 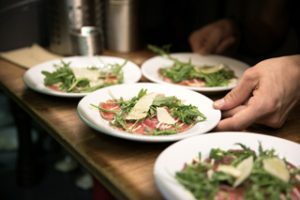 Having opened its first site in St John’s Wood in June last year following a series of pop-ups, Morso is looking to add two more sites in north west London. Areas being target are believed to include Hampstead, Belsize Park and Primrose Hill. Propel understands Morso is looking to grow to ten sites by the end of 2021 and will then reassess its plans for expansion. 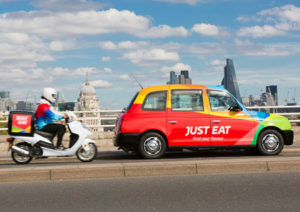 The company is believed to be aiming to build clusters of sites in outlying areas of each corner of London, with locations such as Blackheath, Dulwich and White City among its potential targets. The plan is to focus on communities outside of zones one and two, securing secondary, non-prime sites. It is thought the third stage of growth would also see the company open its first franchise locations. Having built a 20-plus estate over the next ten years or so, it is believed the company would seek an exit with a trade sale. Commercial director Barak Peled said: “Our restaurant is in one of the quietest roads in St John’s Wood but we are fully booked two or three weeks ahead and we are seeing some of our customers dine with us twice a week.” Of the crowdfunding campaign, Peled said: “It’s more than just being about raising the money – it’s about letting customers and communities become part of our business. We don’t really want to go down the private equity route at least for now because we want to be in control of our growth.” The concept is the brainchild of former Jamie’s Italian and Carluccio’s chef Paolo Vernetti who, along with Vanessa Vaz, Peled and Barry McCaughley, has created a concept that combines fresh pasta and small Italian bites with grappa-based cocktails. Last year Morso appointed former Intertain chief operating officer and current East Coast Concepts managing director Simon Kaye as non-executive director to support its growth plans. So far, the company has raised £92,820 from 31 investors with 29 days of the crowdfunding campaign remaining. 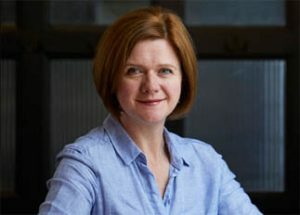 The Inn Collection Group, which is backed by Alchemy Partners, has appointed Claire Burgess as its new chief finance officer. Burgess succeeds Ian Stein, who will step down from the board in May. A former lead advisor with KPMG’s corporate finance team in Leeds, Burgess has held senior key growth roles in the US. She set up white marble producers TBGS Holdings and JB Processing in Alabama and was part of the senior management team at construction design and manufacturing giant Blox. Burgess said: “I am excited to be joining The Inn Collection Group and share its buy-and-build growth strategy vision. I want us to be able to grow the business efficiently and effectively while preserving our ‘pubs with rooms’ identity, which is what the group does so well. It’s about growing at a rate that makes a difference, not growth for growth sake.” The Inn Collection Group has further added to its leadership team with new appointments, including property and development manager Graeme Wood and finance controller Chris Sheldon and has promoted Chris Moor to southern operations manager and Richard Moore to group development chef. Managing director Sean Donkin said: “I am delighted to welcome Claire to the team. Her experience, drive and character will make a significant contribution to our growth plans. Along with our newly strengthened leadership team and with strong revenue investments in place, we are on track to continue building our portfolio with sites that fit our blueprint of pubs with rooms, providing high-quality accommodation, service, food and beverage.” Earlier this year, the ten-strong Inn Collection Group secured £10m from OakNorth as it plans to more than double its portfolio to 21 sites by 2022. The group said it would continue to seek development opportunities to grow its portfolio in the Lake District and Yorkshire as well as the north east of England. 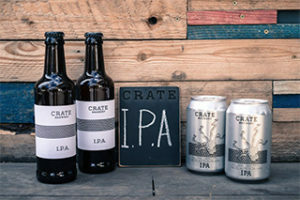 London-based Crate Brewery has passed the £750,000 mark in its fund-raise on crowdfunding platform Crowdcube after receiving a £130,000 investment from Meantime Brewing Company co-founder Lars Huser. Huser has also agreed to become a non-executive director of Crate, focusing on the financial and strategic development of the business. Crate was originally aiming to raise £500,000 to fund a major refurbishment of its Hackney Wick home that will also see zero-waste Brighton restaurant Silo move to the capital. Crate’s founders, brothers Tom and Jess Seaton and Neil Hinchley, were offering 4.21% equity in return for the £500,000 investment, giving the company a pre-money valuation of £12m. So far, 1,124 investors have pledged £751,770, and the campaign continues to overfund with four days remaining. Part of the refurbishment of its home in The White Building will see the team develop a restaurant space with Silo founder Doug McMaster, who will also host workshops in a new space next to the restaurant alongside talks on food, beer, art and culture. Tom Seaton said: “We’ve had a big investment come in. Lars Huser, co-founder of Meantime Brewing Company, has invested £130,000, helping us reach our second target! The extra funds raised will go towards a canning line to develop the brewing process. Lars has also accepted a role at Crate as a non-executive director, focusing on the financial and strategic development of the business. We are excited to have so much experience joining the team and helping us reach our goals of growing Crate.” Crate achieved £3.95m turnover in FY2018 with Ebitda of £88,000. 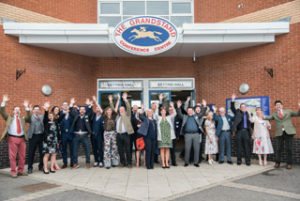 Kent brewer and retailer Shepherd Neame has acquired the Horse & Groom in the village of Wilmington from multi-site operator GC Mallen for circa £5.5m – industry sources indicate GC Mallen acquired it from Ei Group three-and-a-half years ago for circa £700,000, meaning a £4.8m profit on the site. All staff have been retained. Shepherd Neame director of pub operations Nigel Bunting said: “We’re delighted to have acquired the Horse & Groom – it’s a fantastic pub, with a great reputation for fresh, locally sourced, food in a relaxed and friendly atmosphere. As such, it fits perfectly with our portfolio of high-quality destination pubs, and we look forward to building on its excellent reputation.” Garry Mallen said: “It’s been a wonderful three-and-a-half years working with (general manager) Paul Giles, and Laura Parnell, head chef, and I can’t think of a better fit than Shepherd Neame for this great pub.” Shepherd Neame operates 322 sites in London and the south east. Last week, it acquired The Compton Cross in Soho from Marmalade Pub Company, the managed investments partnership between Ei Group and The Marylebone Leisure Group. The Propel Multi Club summer conference and party has opened for bookings. It takes place on Thursday, 27 June at the Oxford Belfry, which is just off the M40. The conference will be followed by the summer party, with an evening barbecue, the Big Fat Quiz and the legendary sounds of DJ Big Lee. Daniel Spinath, founder of Crepeaffaire, will talk about the genesis, development and future potential of his brand, backing from BGF, airport locations and franchising the brand. Operators can claim up to two free places by emailing Jo Charity at jo.charity@propelinfo.com. Rooms (bed and breakfast) are also available at £125 plus VAT and can be booked by emailing Jo. Mosaic Pub and Dining has launched a darts bar in Birmingham’s Jewellery Quarter. The Mosaic companies, led by James Watson and Peter McDonald, has opened 180 Club in St Paul’s Square. It houses six oches, including a private room, and is able to host 14 players per oche. 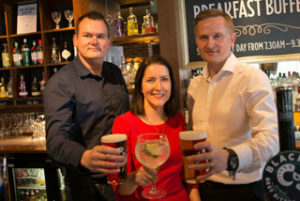 The launch follows the group’s acquisition of The Rectory last September alongside two other Birmingham pubs for a total of £1.3m. Aiming to attract a new demographic to darts, 180 Club also offers sharer cocktails and New York-style snacks. McDonald previously said: “This is a new concept for Birmingham as well as Mosaic Pub and Dining but we know this underground darts experience will work and we’re proud Birmingham is going to be our pioneer city. The concept is simple. 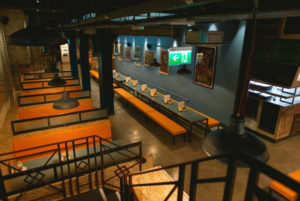 We’re making darts cool, bringing the fast-paced competitive nature of the sport into the 21st century and giving consumers a great experience.” 180 Club adds to Mosaic Pub and Dining’s other venues in the city – The Button Factory, The Distillery, Frederick Street Townhouse, Queens Arms, and The Florence. Earlier this year, Mosaic Pub and Dining added three London sites to its portfolio, taking its total to 24. Morty & Bob’s has opened its second site, at the Coal Drops Yard development in King’s Cross. Owner Charlie Phillips said he has opened a “grown-up version” of his Hackney restaurant. The new venue offers the brand’s grilled cheese toasties, salads and weekend brunches alongside all-day hot sandwiches. Much like its Hackney site, industrial brick walls, low lighting and potted plants provide the decor. But Coals Drop Yard heralds a new era for Morty & Bob’s with an upgraded evening offer of small plates, bar snacks as well as crafted cocktails, wine and beer. The concept is named after Phillips’ two grandfathers. Soul Food Enterprises, which is led by Bea Vo and operates US-inspired restaurants Stax and Famous Flames in London, has replaced its Boondocks diner in City Road near the Old Street roundabout with new concept Harlem Soul. The soul food restaurant offers “American urban cuisine” such as burgers, wings, jackfruit tacos, soft shell crab, buttermilk chicken and waffles in maple syrup. Desserts include cheesecake and brownies, while the drinks list features freakshakes, craft beer and cocktails. Set across two floors, the lower bar opens late with DJs and live soul acts. Vo, who also founded Bea’s in Bloomsbury, opened Stax Diner in Carnaby in 2015. She opened Boondocks, which offered chicken and waffles, a year later and wings concept Famous Flames in Camden Market in February 2017. Splendid Hospitality Group has acquired The Stanwell Hotel in the Middlesex village of Stanwell. The company has bought the 53-bedroom property, which is near Heathrow airport, and features a restaurant and function space. The addition brings Splendid Hospitality’s portfolio of hotels to 20 properties across the UK. 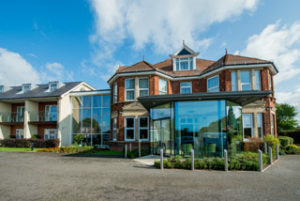 Chief executive Stuart Bailey said: “We are delighted to welcome the Stanwell Hotel and its team to the Splendid family. This acquisition further cements our foothold at Heathrow airport and surrounding business parks. The hotel will continue to operate independently as the Stanwell Hotel until we agree the appropriate brand option for the next phase of the hotels’ transition.” Splendid Hospitality Group also operates the five-strong Absurd Bird brand and 40 KFC restaurants. Tom Byng, founder and former chief executive of Byron, has invested an undisclosed sum in Bundobust, the Indian street food and craft beer concept, Propel has learned. Byng, who left the better burger chain at the end of 2016, has taken a stake in the current two-strong business and become non-executive chairman as it focuses on further growth. Bundobust, which operates in Leeds and Manchester, opens in Liverpool next month and has secured a second site in Manchester, in Oxford Road, for an opening later this year. The concept, which become known for its vegetarian Indian food and large craft ale range, was founded by Mayur Patel and Marko Husak in Leeds in 2014. It opened is second site in Manchester’s Piccadilly in December 2016. The upcoming Liverpool site will be based on the vacant first floor of a Bold Street building opposite The Crafty Chandler pub. Propel understands Bundobust has attracted investment interest from a number of parties during the past two years. Regarding the Byng investment, Patel and Husak said: “As Bundobust grows we feel we could really benefit from Tom’s advice and experience in building a successful business customers love. We’ve enjoyed getting to know him over the past few months and we’re excited to welcome him as an investor.” Byng said: “I am a big admirer of Bundobust and what Mayur and Marko have achieved so far. They have built a terrific business with a cult following and bags of potential. I’m delighted to be able to offer my support and guidance to help the business grow.” Byng opened the first Byron restaurant in London in 2007. 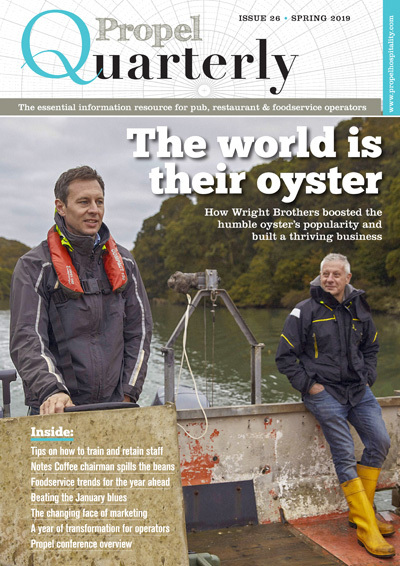 The company was acquired by Hutton Collins for almost £100m in November 2013 from previous owner Gondola Group. Byng left Byron at the end of 2016 when it had grown to a 69-strong business with annual turnover of circa £80m. The Restaurant Group chief executive Andy McCue (pictured) saw his remuneration drop in 2018 after missing out on his annual bonus, the company’s annual report has revealed. McCue, who announced in February he would step down for personal reasons, was paid a total of £729,500 for the year ending 31 December 2018, compared with £1,116,000 the previous year. This consisted of £515,500 salary, £113,000 in taxable benefits and £101,000 pension. In relation to bonus, the remuneration committee set adjusted profit before tax targets and like-for-like sales targets, which were not met, and stretching employee engagement targets, which were met in part. However, for any bonus potential to be paid the threshold of £57m adjusted profit before tax had to be achieved and, since this wasn’t reached, there was no bonus paid. McCue’s salary was raised 1.98% on 1 January 2019 to £525,500, while the average increase for managerial employees across the group was 2.1%. Meanwhile, Kirk Davis received total remuneration of £394,000 in his first full year in office, which consisted of £320,000 salary, £10,000 in taxable benefits and £64,000 pension. Davis has received a 2% salary increase to £362,100. 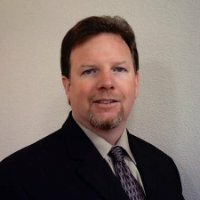 For 2019, in view of his resignation, McCue will not be awarded a bonus or granted a long-term incentive payment award. Davis will again be eligible for a maximum annual bonus of up to 120% of salary – 50% of any bonus earned will be deferred in shares for three years. The remuneration committee intends to grant a long-term incentive payment award of 200% of salary for Davis, increased from 150% in 2018 to reflect the importance of his role during the transition to a new chief executive, based on stretching total shareholder return and adjusted earnings per share targets. Mexican brand Chilango has closed its Burrito Bond 2 offer having raised almost £3.8m. The brand, which was founded in 2007 by Eric Partaker and Dan Houghton, operates ten restaurants across London and one in Manchester. A 12th restaurant is due to open in Birmingham in mid-2019. Burrito Bond 2 was offering 8% interest annually over four years, with bondholders offered the opportunity to redeem their bond in full at maturity. A total of £3,769,500 has been raised, with investors including former Itsu managing director David Haimes, ex-Domino’s Pizza chief executive Chris Moore and former McDonald’s UK marketing vice-president Laurie Morgan. The funds will be used to refinance some of its existing debt and open new sites. 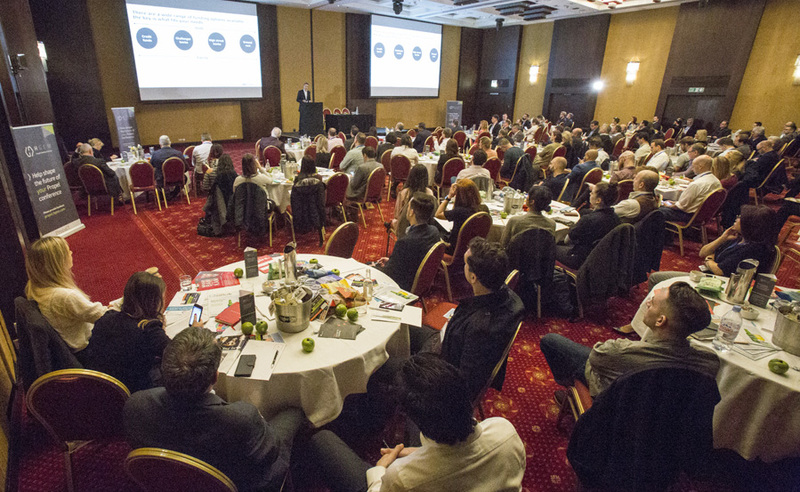 Partaker told Propel: “We are extremely pleased with the results of our Burrito Bond 2 campaign. With the support of nearly 800 guests and fans we’ll continue our charge to make the world a more vibrant place.”In the financial year just ended, Chilango’s restaurants generated more than £11m in sales and £2m in Ebitda, with all 11 restaurants profitable. 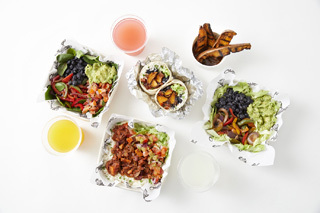 Chilango has identified a number of areas in high-footfall central London locations for its target audience of students and young professionals. It is ideally seeking ground-floor accommodation ranging from 500 to 2,500 square feet with sites in or near residential, office, retail and leisure areas, as well as universities, hospitals and transport hubs. In 2014, Chilango raised £2.1m through a mini-bond on crowdfunding platform Crowdcube. Bharti Radix, formerly of The Draft House and Jamie Oliver Restaurant Group, has joined Department of Coffee and Social Affairs (DoCaSA), the fast-growing coffee chain and wholesaling group, Propel has learned. Radix joins DoCaSA’s parent company, Coffeesmiths Collective, as group finance director after starting the year as finance director at Petersham Nurseries, which operates two sites – its original restaurant, teahouse and homeware and garden store in Richmond and its more recently opened Covent Garden site. Radix was previously interim finance director at Jamie Oliver Restaurant Group for four months before handing over to Tamsin Ashmore. Radix spent three-and-a-half years at The Draft House, helping the transition period following the pub group’s acquisition by Scottish brewer and retailer BrewDog, before departing last May. Radix spent an earlier five-year stint of her career with Jamie Oliver across his Fifteen restaurant, charitable foundation and international business. DoCaSA has been strengthening its presence in London and the rest of the UK through a number of acquisitions in the past six months. 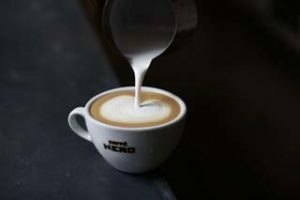 It most recently acquired the Nordic Bakery business and took a majority stake in Brighton-based, seven-strong Small Batch Coffee, which was previously backed by sector investor Luke Johnson. It has also acquired Baker & Spice, the Patisserie Holdings brand; Bea’s of Bloomsbury; Tap Coffee; mobile coffee brand Café 2 U; and two Bristol-based independent coffee shops. 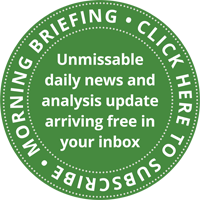 The Breakfast Group, the Eric Yu-founded restaurant bar group, has appointed Ross Palmer, formerly of Novus, as its new managing director. Palmer joins the eight-strong group after eight years at Novus where was operations manager with the company’s Landmark segment, which accommodated its larger multi-room venues predominantly focused in the City of London market. The Breakfast Group was founded in 1991 by Yu and Connie O’Donovan. It operates seven sites in central London including two Salvador & Amanda sites in Covent Garden and Bloomsbury plus 68 and Boston in Soho, and Burlock in Marylebone. It also operates Gas Street Social restaurant and bar in The Mailbox scheme in Birmingham. Foodco-owned international cafe restaurant brand Jamaica Blue is to open its first concession. The company will launch its sixth UK site in total on Friday (19 April) at retailer Next’s newly refurbished store in Birmingham’s Junction 9 Retail Park. Jamaica Blue head of estates Joshua Nixon said: “This opening is the culmination of more than a year’s work and planning with Next and we are pleased to have been the cafe brand of choice for the store’s reopening. We view this as the beginning of a strong brand partnership between Jamaica Blue and Next and look forward to building on this partnership by opening more concessions with them in the not-so-distant future.” Next store manager Marcus Shelley added: “We are excited to open our new store, which will include new concessions Paperchase, Virgin Holidays and the first ever Jamaica Blue at Next.” Jamaica Blue was founded in Australia in 1992 and operates more than 160 cafes worldwide. 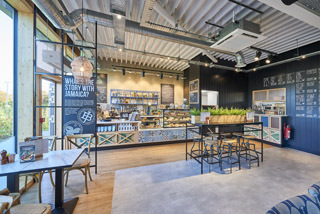 Foodco opened the first Jamaica Blue cafe in the UK in Cambridge in December 2014 and has launched further sites in Chelmsford, Northampton, Reading and Rushden Lakes, Northamptonshire. Propel understands the company is in discussions on further sites and is also focusing on hospitals, airports and “strong” shopping centre locations. 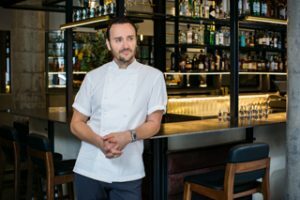 Chef Jason Atherton (pictured) and his business The Social Company are to transform Mayfair-based French bistro Little Social into a new concept. Launched six years ago, the venue in Pollen Street will close on Friday (19 April) to reopen with a new look and menu on Wednesday, 8 May. The 60-cover restaurant, No.5 Social, will feature banquette seating and celebrate seasonal British produce under the leadership of executive chef Kostas Papathanasiou and restaurant manager Nils Cassignol. Formerly, senior sous chef at Atherton’s Michelin-starred Pollen Street Social, Papathanasiou has also worked in The Ledbury and The Fat Duck. His menu will include English heritage tomato salad with goat’s curd, almonds and fennel; and poached Hebridean halibut with celeriac truffle emulsion and purée. Desserts will include Richmond Park honey with oat crumble, milk ice cream and meringue. The wine list will encompass English and international bottles with a focus on lesser-known varieties from Europe alongside cocktails featuring British ingredients. Atherton said: “Kostas has been an important part of The Social Company for the past three years and we felt it was time he was given his own project to run.” Papathanasiou added: “To be given the opportunity to launch a restaurant that reflects my cooking style is a real honour.” Atherton’s empire spans six countries and includes seven restaurants in London alone. James Ramsden and Sam Herlihy, who operate London restaurants Pidgin and Magpie, are to launch a sandwich bar concept at the Coal Drops Yard development in King’s Cross. Ramsden and Herlihy will launch Sons + Daughters next month offering sandwiches, salad, soft-serve ice cream, cocktails, beer, wine on tap, and organic coffee. Sons + Daughters has been revealed among the latest wave of brands set to join the shopping and restaurant district. 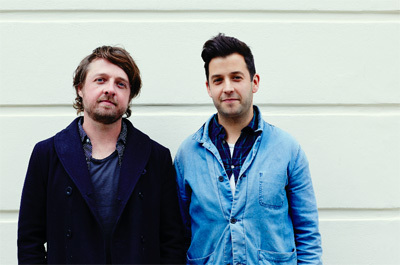 It will be joined by The Hart Brothers’ latest venue at Coal Drops Yard, Parrillan, which will also open next month. The partly covered outside space will see diners grill their own meat, fish and vegetables on their own “parrilla”, a mini-charcoal grill. The Harts already operate a third site for Mexican taqueria concept El Pastor at Coal Drops Yard, a fourth for Barrafina restaurant and new-concept wine bar and restaurant The Drop. Papa John’s has partnered with holiday park operator Abbeyford Leisure to open an outlet in St Andrews, Scotland. The site has opened at St Andrews Holiday Park in Kinkell Braes and will also deliver to the town’s residents. Abbeyford Leisure chairman David Evans said: “We were looking for something different and special to introduce as a food offering at our St Andrews park and were delighted when Papa John’s wanted to ‘play ball’. This is Abbeyford’s first link-up with a big brand such as Papa John’s and, as a group of six holiday parks across the UK, who knows what the future holds?” Papa John’s has more than 400 sites across the UK. My Million Pound Menu winner BBQ Dreamz is to operate the summer season at John Lewis’ Oxford Street rooftop space under its new name – Bong Bong’s Manila Kanteen. The concept will offer the same authentic Filipino family recipes with dishes such as adobo-glazed chicken, grilled aubergine satay curry and Asian roots salad. New for this year, John Lewis has introduced “walk-in Wednesdays” with visitors able to try the food without booking. The space will also offer bookable dens for four to ten diners and feature the Caravan Stage with performances from DJs, artists and acoustic musicians. There will also be masterclasses and cinema screenings. The event, Roof Fest London, will launch on Friday (19 April) and include a cocktail bar operated by Background Bars with drinks including chilli margaritas and the signature Roof Fest London (Havana rum, banana liqueur, passion fruit and mint). Roof Fest London will run until Sunday, 29 September. Last year’s rooftop operator was chicken sandwich concept Butchies. Incipio Group has signed four street food traders for this year’s Pergola Paddington summer season, which launches next month. 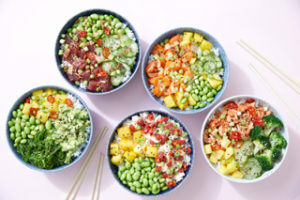 The space will open on Thursday, 2 May and house a third site for Hawaiian poké specialist Honi Poké. The other traders will be Babek Brothers, which offers kebabs and halloumi fries from its site at Street Feast’s Dinerama; An Choi, a new spicy wonton dumplings and small plates concept by the Salvation In Noodles team; and Smash Patty, a new concept from better burger brand Patty & Bun that will feature a potato batch bun made by Bread Ahead. Pergola Paddington will attempt to transform British summertime into “Balearic high summer”, with the roof removed, white-washed floors, bookable daybeds and DJs at the weekend. There will also be two bars, alfresco seating for 850 diners and undercover seating for rainy days. Earlier this week Patty & Bun said it was “testing the water” with a new chicken concept – Jefferies – at two other Incipio Group sites, The Prince and Pergola Olympia. Last month Incipio Group secured £5m from entertainment and leisure investor Edition Capital to open six sites in the next 18 months, including its first outside London. The £5m was raised through EIS, valuing the business at £20.5m. This will be used for sites in Wimbledon, Brixton and Putney, with venues also planned for Mayfair and Fulham as well as Birmingham. Soho-based bao and pickle cafe concept Bun House has relocated to a larger site, in Chinatown London. Founders Alex Peffley and Z He have relaunched Bun House in Lisle Street offering signature Cantonese steamed buns with two new items on the menu – beef brisket and a soft, brioche-style pineapple bun. The site also pays homage to Hong Kong food stalls, with a small hatch inside serving snacks such as curried fish balls. The drinks menu celebrates Hong Kong’s burgeoning craft beer scene alongside tea-based cocktails and cold-brewed tea. The 16-cover dining space offers a further 40 seats upstairs. He said: “It is particularly exciting for us to open Bun House in the heart of Chinese food in the city.” Julia Wilkinson, head of group restaurant strategy at Chinatown London landlord Shaftesbury, added: “Z and Alex’s design backgrounds add a fresh creative aesthetic to Lisle Street.” Peffley and He launched Bun House in Greek Street, Soho, in May 2017. 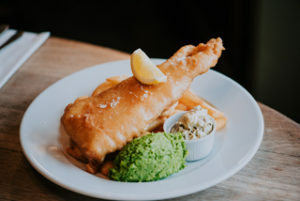 Wiltshire-based brewer and retailer Wadworth has launched new spring and summer gluten-free menus and an increased vegan offering for its managed pubs. More than 100 new gluten-free or vegan dishes are available for pubs to choose from. They have been created by Wadworth’s food development team. Dishes include gluten-free beer-battered fish and chips and a range of sandwiches using artisan free-from bread. Wadworth operations manager Toby Bartholomew said: “Many people have food tolerances that reduce the choices available to them when eating out and many choose it as a lifestyle choice. We have created menus that offer a great selection to everyone, whatever their lifestyle choice or food intolerance. Gone are the days when it’s acceptable to just offer vegetable lasagne as an option on your menu and, because of this, menus are becoming more exciting and varied and Wadworth is playing a huge part.” In total, 55 managed Wadworth pubs in the West Country will offer the new gluten-free menu. 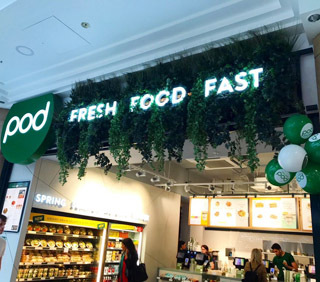 Pod, the 22-strong London healthy eating operator, has reported a reduction in operating losses for the year ending 3 January 2019. Operating losses were £432,551, compared with £1,452,566 the year before. Overall loss before tax was £486,973, compared with £1,748,884 the previous year. The company stated: “2018 saw a dramatic turnaround in performance for Pod. The changes to the operating model that new chief executive Alex Young started to implement in the second half of 2017 saw a huge improvement to trading and profitability. The market remained challenging, with competitor expansion and a slowdown in consumer confidence in the second half of the year. However, these factors did not stop the business achieving a £1.2m swing at Ebitda level, delivering £400,000. Total sales of £17.4m were up from £17.2m in 2017, an increase of 0.9% year-on-year. This was achieved with two fewer trading stores and reflected growth in like-for-like sales of 4%. The delivery business continued its strong growth, with an uplift in sales of 25% on the previous year. Alex and the team have focused on getting maximum value from our supply chain while still maintaining the quality offer Pod is known for. An improvement in the cost-of-sales percentage of more than three percentage points was a large factor in our improved profitability. As was forecast in the prior period, we saw further structural cost changes with an increase in the National Living Wage and upward only rent reviews. Despite increases in the National Minimum Wage, the business was able to improve its labour efficiency by 0.3%. This was achieve by a focus on rotas. Rental prices are a major issue affecting the profitability of the entire industry and place an increased pressure on the business model of all retailers on the high street – 2018 included upward rent reviews on two of our sites.” Store Ebitda increased to £2.3m from £1.4m the year before. 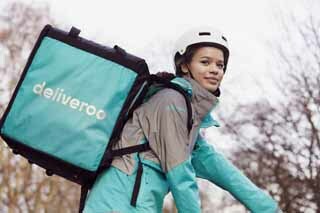 The company also operates two delivery hubs.